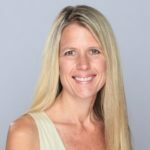 Planning a kid-free Orlando vacation? Why not enjoy a much needed date night? There’s so much more to Orlando, Florida than just the theme parks. 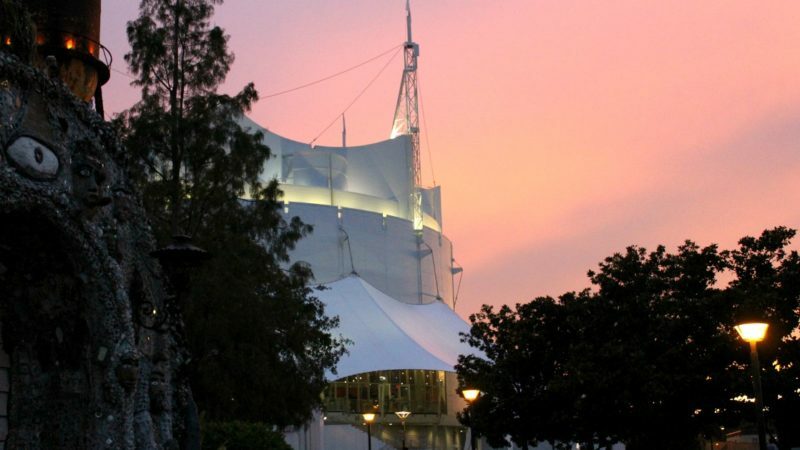 You’ll find everything from circus performances and Latin dancing to a speakeasy type bar where you need a “secret” code to get in. 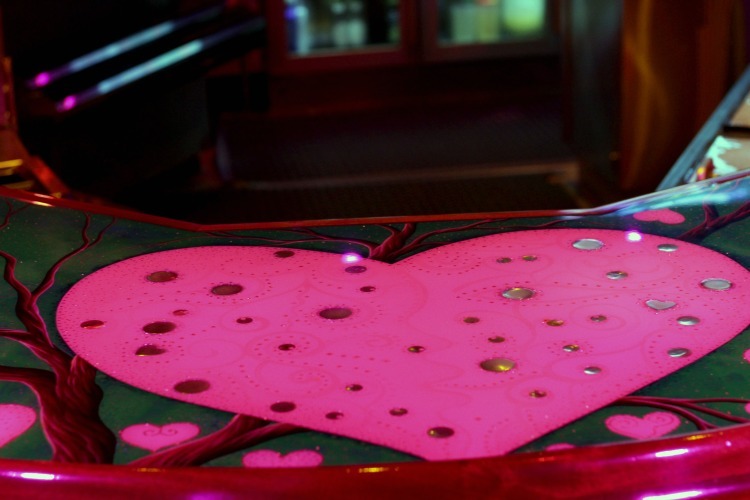 The date night possibilities are endless and who knows, you may even run into Carrot Top somewhere along the way! My hubby and I don’t get much alone time so when our girls went on vacation to my parents’ house, we wanted to make the most of it. After a quick getaway to Clearwater, Florida, we decided that it would also be fun to have a kid-free Orlando vacation. Not only that, I wanted every night to be date night. You’ve got to get them while you can, right? Since there’s no shortage of things to do in Orlando, we had plenty of options to choose from. After our three Orlando date nights, I don’t think we could have chosen any better! We couldn’t escape Disney altogether…I love it way too much! Disney Springs is a lot of fun for the kids but it’s also a great place to visit when you’ve left the kids behind! There are so many restaurants, shops and things to do that you could even plan for your date to last the entire day. It seems that there are new restaurants opening every week in Disney Springs but I’ve been especially excited about the new Paddlefish. My husband and I had a sentimental attachment to Fulton’s Crab House and when they complete made it over as Paddlefish, I couldn’t wait to check it out. The first thing you notice when you enter the giant paddleboat are the large windows overlooking the lake. 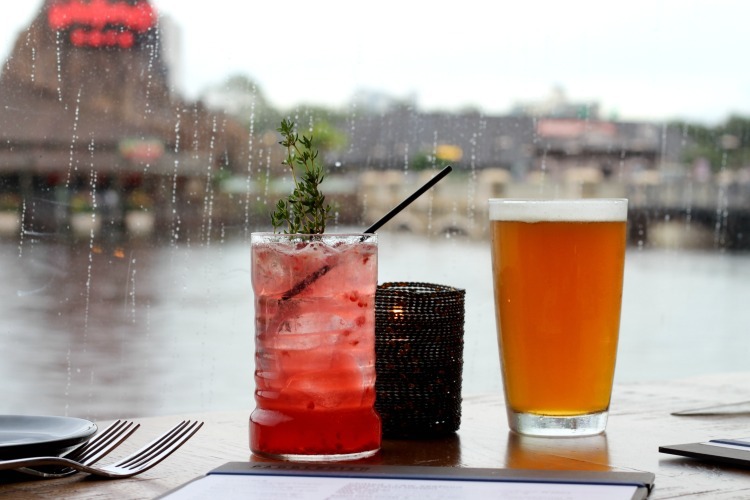 We ordered a couple of drinks and sat back to enjoy, Florida showers and all. 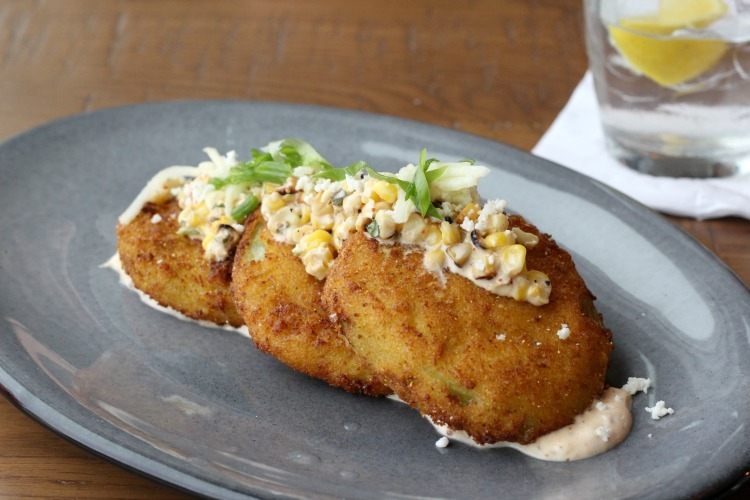 Even though I’m from the south, I’d somehow never tried fried green tomatoes. My hubby hadn’t either so we gave them a try. Made with thick slices of green tomato, they were really delicious dipped in the remoulade. 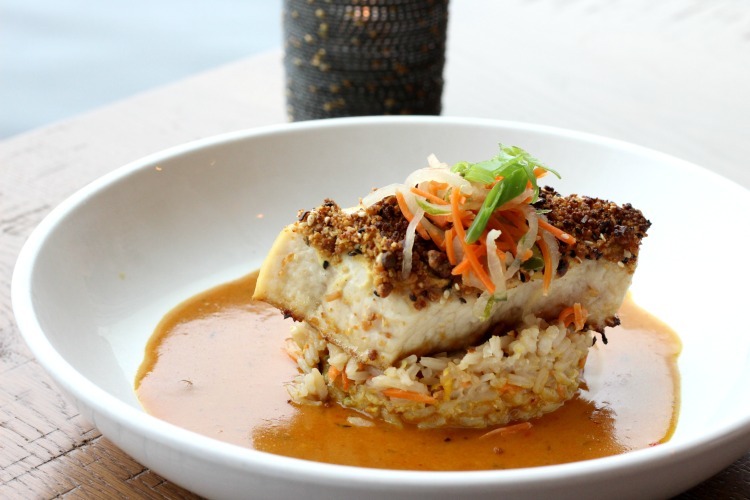 Since they didn’t have the Hawaiian opah, our waitress recommended I order the swordfish with the same macadamia nut crust, curry and crab-fried rice. It was a great suggestion and I really enjoyed it. 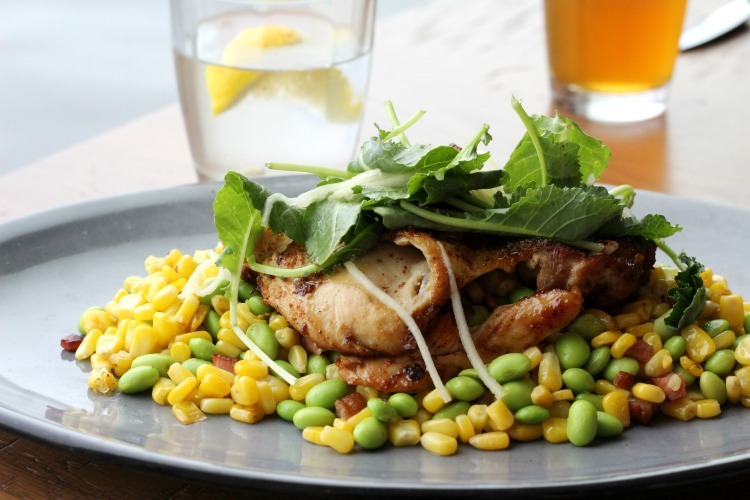 Jon ordered the half chicken with Carolina mop sauce, and edamame bacon succotash. It got the thumbs up! 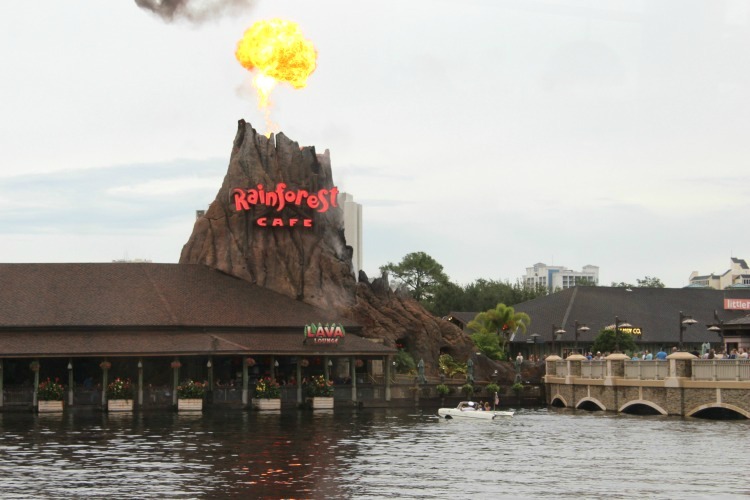 From time to time, we’d see the Rainforest volcano “erupt” or one of the Boathouse amphicars drive by. It’s not often that you can dine with that type of view! 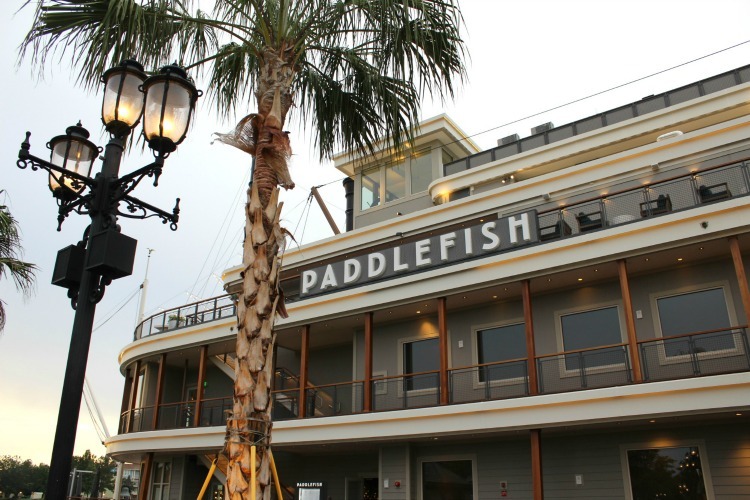 Get the full Paddlefish review here. Date night didn’t end there. 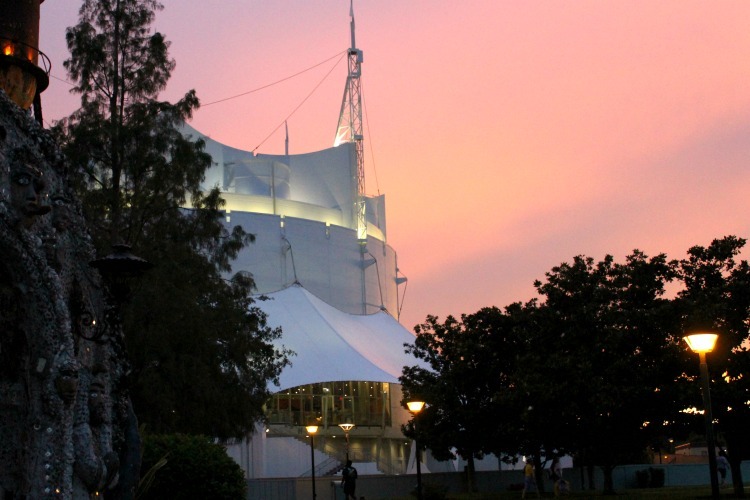 After dinner, we had plans to check out Cirque du Soleil’s La Nouba, also in Disney Springs. Though I’ve been to Disney Springs regularly over the past year, this was the first chance I’ve had to see it. It didn’t disappoint! Like other Cirque performances, this one features hilarious clown skits, fabulous costumes and a variety of acts, each one better than the one before. I felt a little guilty being there without the girls, since I knew they’d love it too. I think I see another trip to Disney Springs in my future. 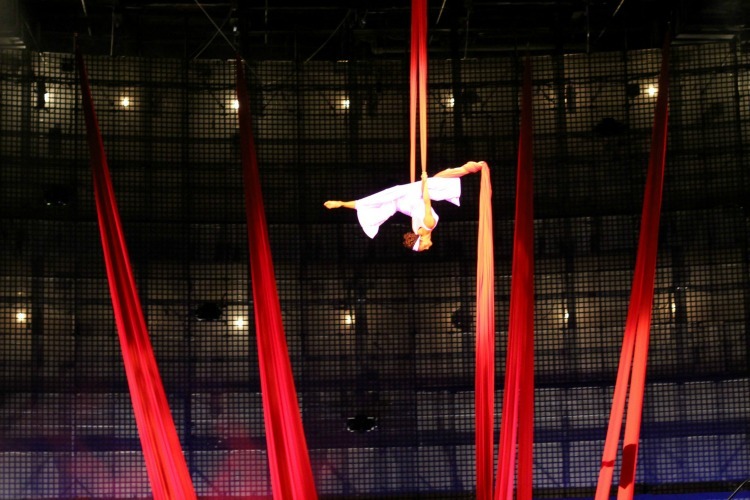 TravelingMom Tip: If you’re interested in seeing La Nouba, be sure you make it by the end of the year since it will finish its 19 year run on December 31st. 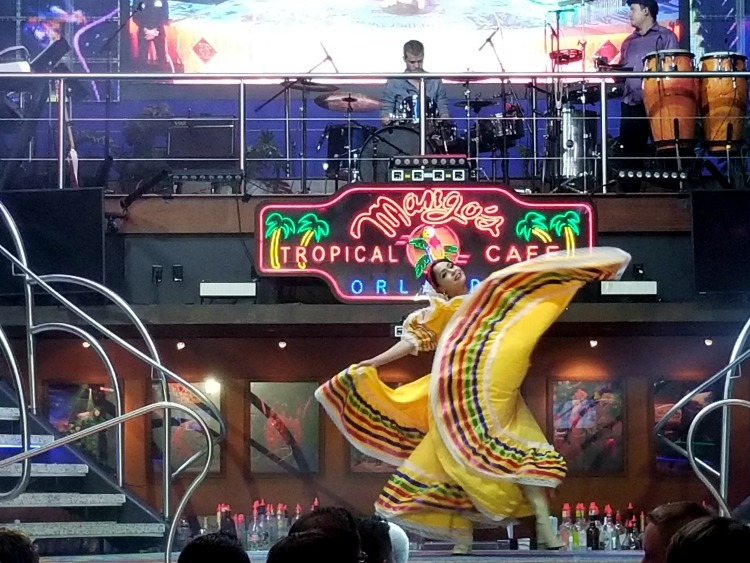 For our second date night, I chose Mango’s Tropical Cafe, where you’ll get dinner and a show at the same time. 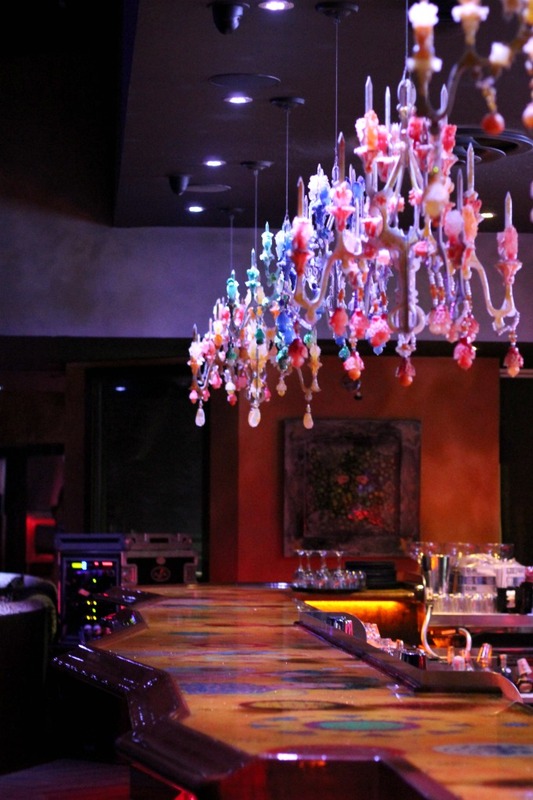 A fun restaurant/bar with a Latin twist, it’s impossible not to have fun here. The original Mango’s opened in South Beach, Miami 25 years ago so this location is brand new in comparison, having opened in 2015. 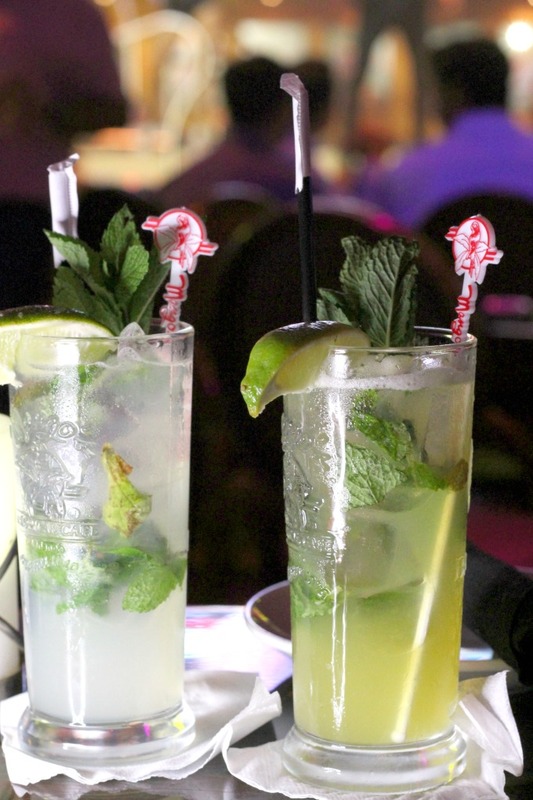 Since Mango’s has such a Latin feel, mojitos seemed like a great choice. They had a large selection to choose from but I went for the traditional Cuban mojito. 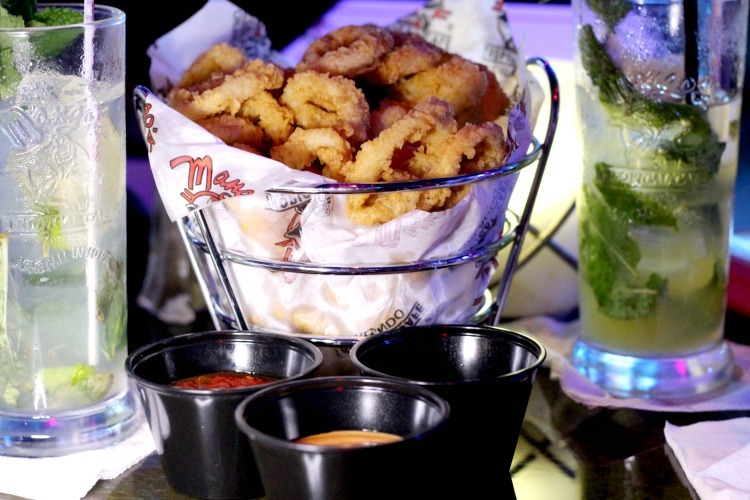 We also ordered calamari for our appetizer. It was served hot and crisp with three different types of dipping sauces. It was delicious, though the serving was so big that we couldn’t finish it. In the meantime, the entertainment had begun. 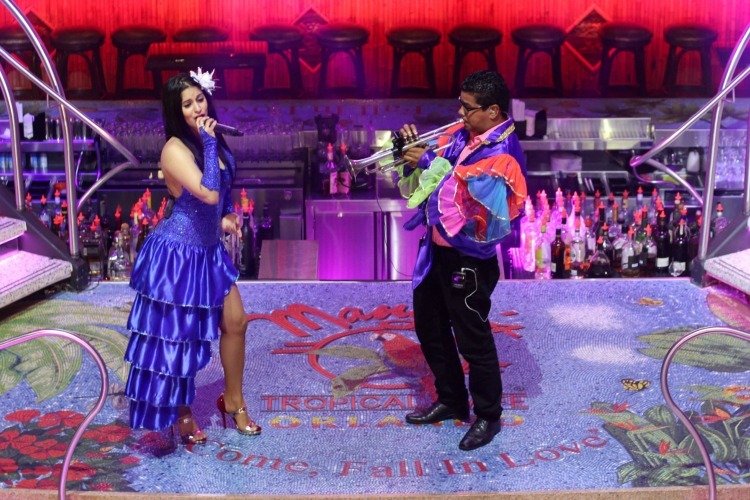 The show features everything from pop to Latin music, with a live band to back it all up. Not only is it fun, festive music meant to put you in a party mood, but the audience loved it when the entertainers came off the stage to interact with the crowd. I have to admit, I got a little excited when “Michael Jackson” walked out! Soon it was time to order dinner and since the Steak Churrasco is one of the most popular dishes at Mango’s, I thought I’d give it a try. I don’t eat steak very often and this was delicious. 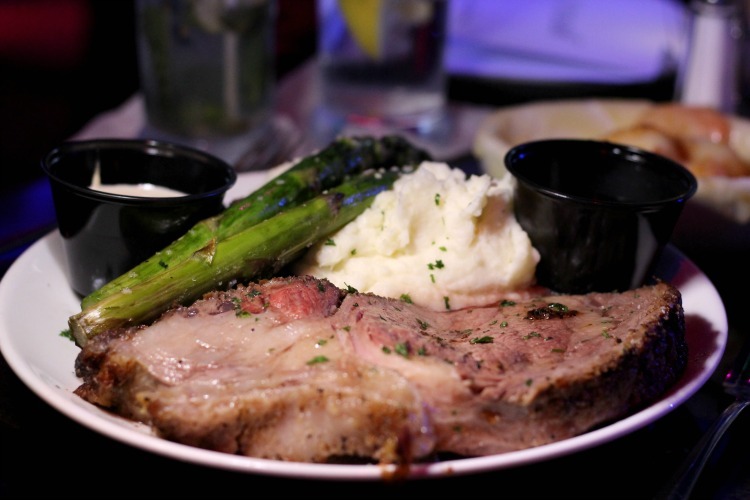 Jon chose the prime rib and though it was a little fatty, he said it was really tasty. Later I wandered through and realized just how big this place is. With eight bars, multiple rooms and an outside patio, it’s much bigger than the original Miami location. The decor is eclectic with some of the same themes running throughout the building. Everything is its own piece of art, from the walls to the floors and everything in between. Even the stage itself is made of mosaic tiles, as you can see in one of the pictures above. The bars are intricately designed and each one is unique. The chandeliers were yet another piece of art. Is it just me or do these resemble dripping wax? 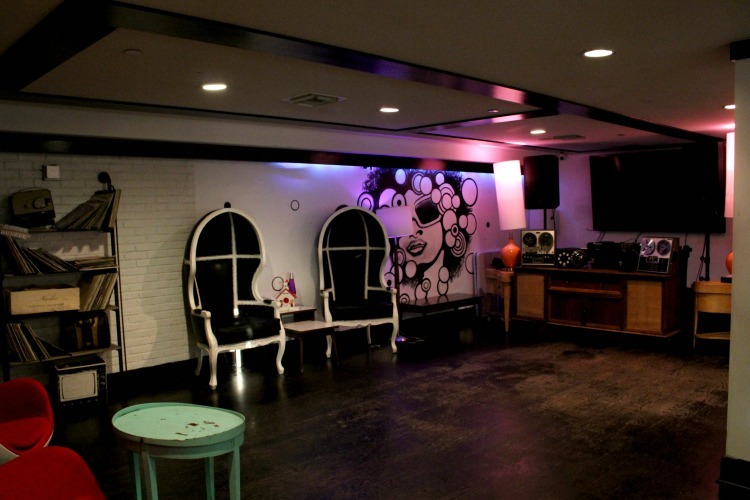 Even though nine different artists designed the artwork and decor, it all fit together for a great look. We had a fantastic time at Mango’s. The food was great, the entertainment was a lot of fun and we would definitely go back again. TravelingMom Tip: While a few people had kids with them, I wouldn’t recommend bringing them. While there’s nothing inappropriate for children, Mango’s just has more of an adult vibe to it. We decided to head over to Winter Park, a suburb of Orlando, after someone had suggested we check it out. I’d never actually heard of it but now it’s one of my favorite new discoveries. It’s a cute little town with lots of shops and restaurants. There’s also a boat tour, which has great reviews, but was rained out the day we were there. Instead we took a stroll through the Morse Museum, where they have the largest collection of works by Louis Tiffany, creator of the iconic Tiffany lamp. While I’ve never particularly been a fan of the Tiffany lamp, I found the museum pretty interesting and it was a great way to spend the afternoon hiding from the rain. 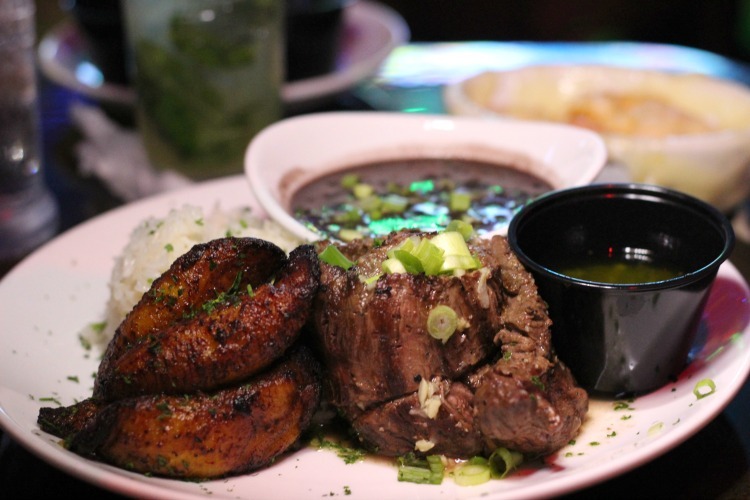 We had dinner reservations at Boca and while the Sarasota location is one of my favorite places for drinks and appetizers, this would be the first time I’d eaten dinner there. Normally I love to eat outside but we took a table inside to avoid the crazy Florida weather. 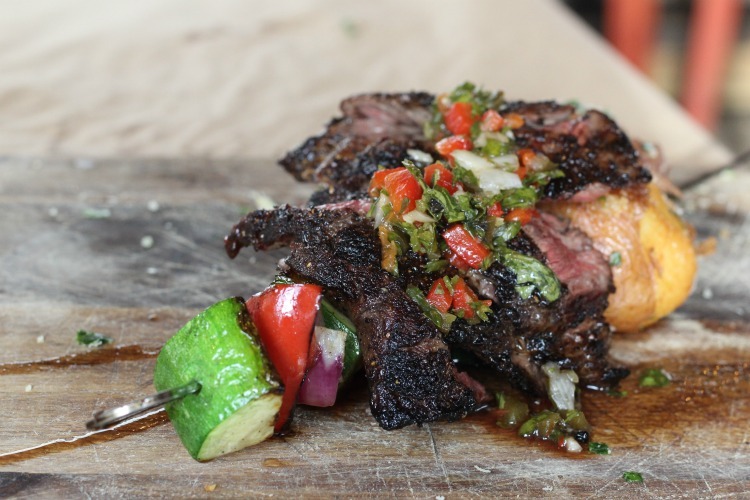 Boca is a farm-to-table restaurant that locally sources as much as possible. There was even a pamphlet on the table that listed the farms where they got their milk, vegetables, meats and more. 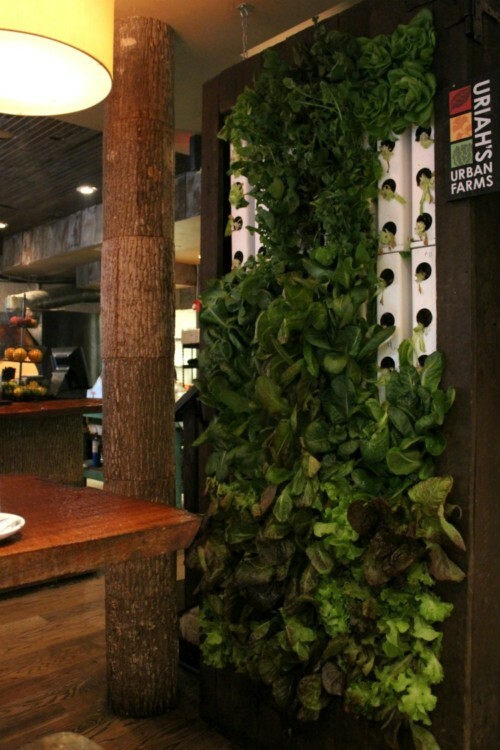 It doesn’t get more local than the living wall in their own dining room though, where they pick fresh ingredients straight from their vertical garden. I’d just seen this for the first time at a restaurant in Clearwater and love the concept. I’d love one on my kitchen wall but with my history of plant neglect, it wouldn’t last long. Since I’d been starting all my date nights with a fancy cocktails, I didn’t think I should stop now. 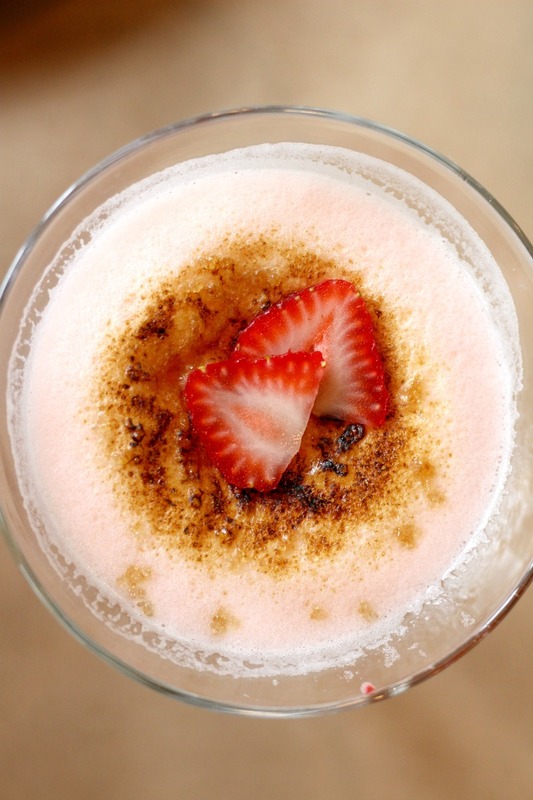 This Strawberry π may just be my new favorite cocktail. 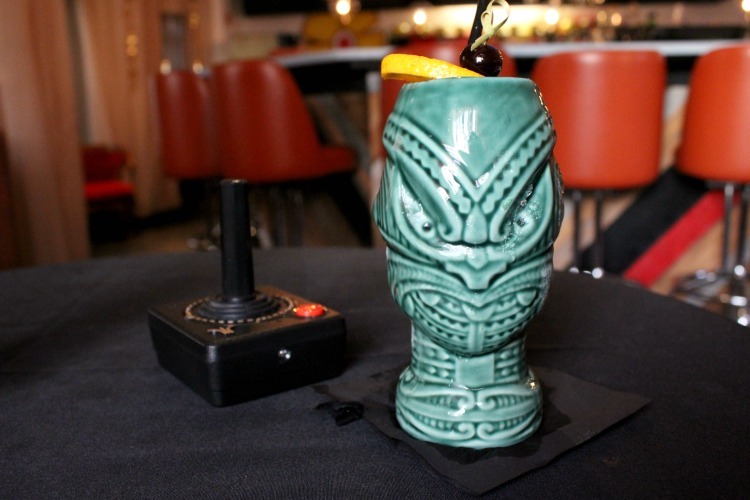 If you like sweet drinks, you’ll definitely want to try it. It really did taste like a cross between a sweet cocktail and a piece of pie…so good! I knew what we were ordering as an appetizer before we even got there. 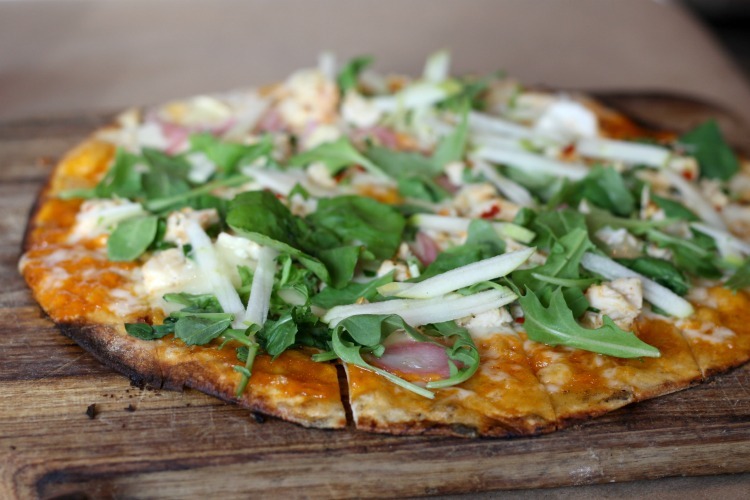 The brie and apple flatbread is to die for and I have to order it every time I go…no exceptions. 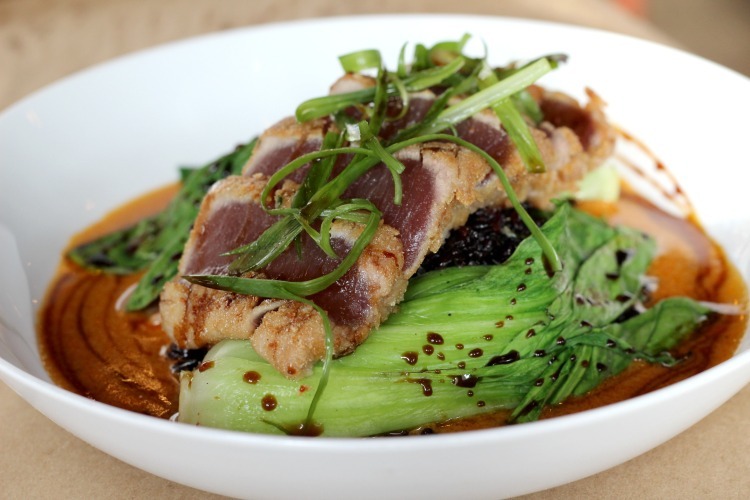 Dinner was yellowfin tuna with kimchi black rice, coconut broth, baby bok choy and a sweet soy reduction. If you enjoy fresh tuna, you’ll really like this. While I’ve never had black rice before, it paired nicely with the tuna and other flavors. Jon’s more of a meat and potatoes guy and he really enjoyed his prime skirt steak. I snuck a little bite and he was right; it was delicious! Dinner was amazing. 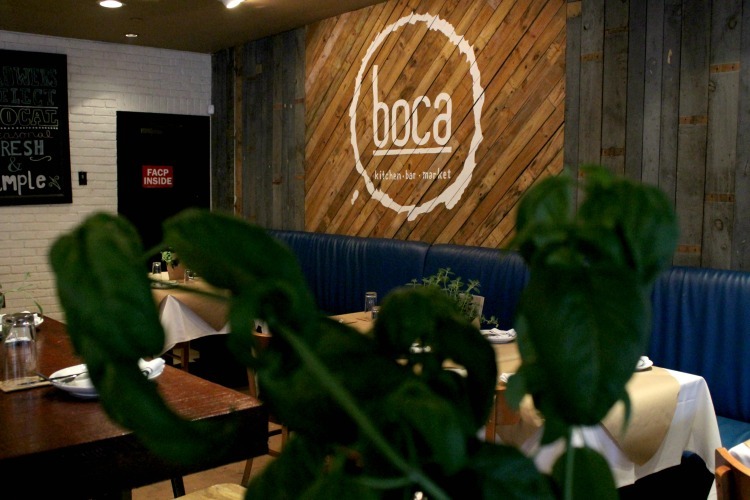 If you’re anywhere near a Boca, I highly recommend it! You may just see me if you visit the Sarasota location. Just look for the girl ordering the Strawberry π. We had big plans for after dinner. Earlier that day, we’d heard about a new disco bar, ParkSocial, that had recently opened. I convinced my hubby that we should check it out. 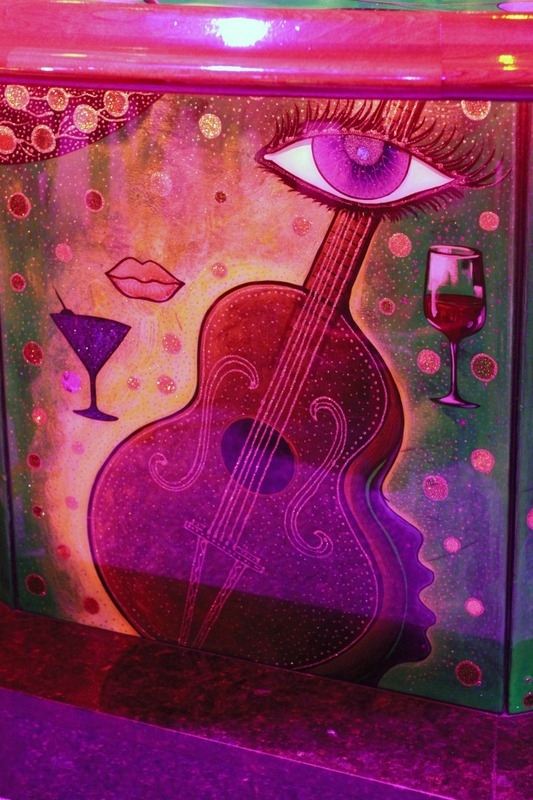 When we arrived at Boca, we realized that the disco bar was right upstairs. 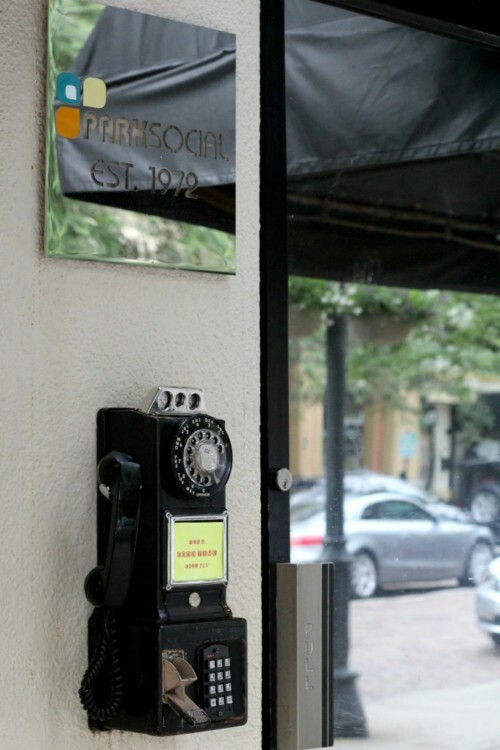 To get to it, you have to go outside, find the payphone and enter the secret code, much like a speakeasy. Don’t worry, the code wasn’t too secret. You can find it right on the front of the phone. Funny sidenote: As I was entering the not-so-secret number, Jon told me that Carrot Top was behind me. I thought I was going to turn around to see a random guy with crazy, red hair, but sure enough, there was the real Carrot Top sitting at the stoplight in his expensive car. It turns out he lives nearby. After our impromptu celebrity sighting, we made our way upstairs where I ordered the Jungle Boogie (I just liked the name). 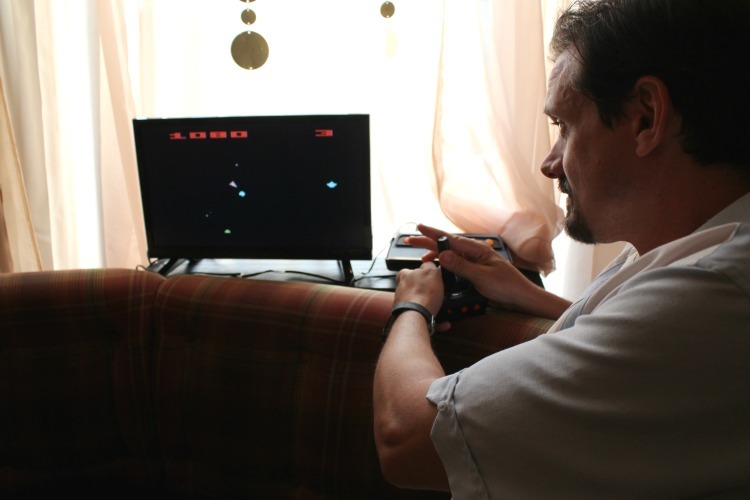 See those Atari joysticks? I thought they were just decor but when we turned around, we saw an Atari console. To our surprise, it actually worked! After a quick game (Asteroids was a lot harder than I remembered), I checked out the rest of the place. Nobody was on the dance floor quite yet but the night was still young. I loved all the 70’s decor. 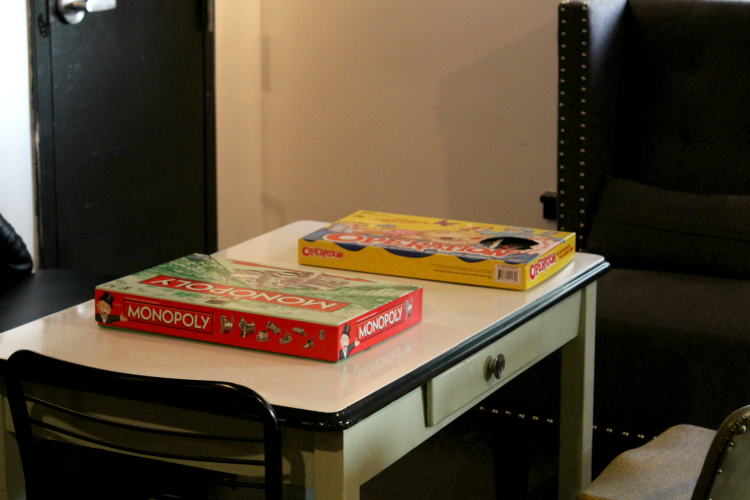 There were Jaws posters on the wall, lava lamps, and even these old games. I think it would be pretty entertaining to watch people play Operation after a few cocktails. Though Jon is more AC/DC than KC & The Sunshine Band, even he had a great time. 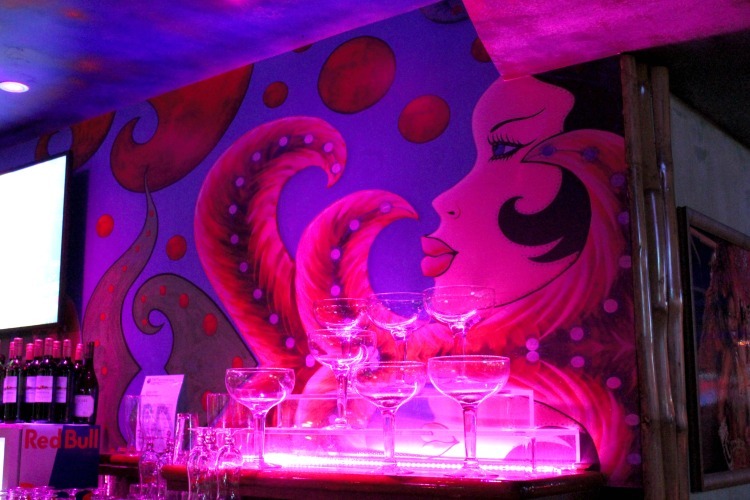 Dinner and disco make a great date night! We had a wonderful getaway and it just goes to show that there’s much more to Orlando than just the theme parks. 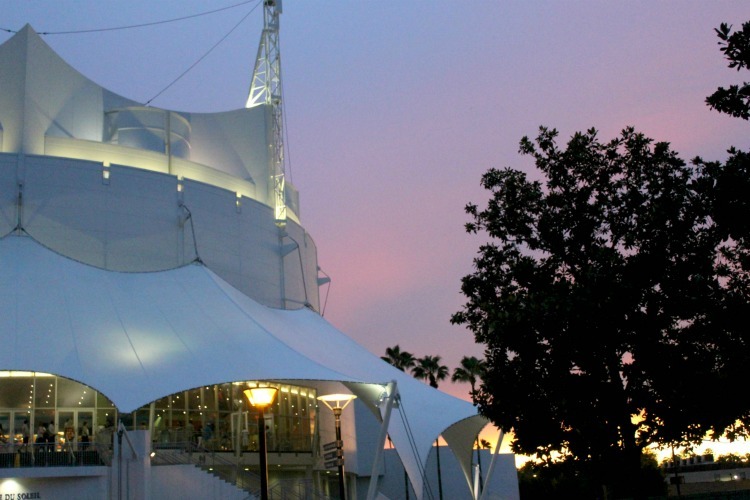 From Cirque du Soleil to disco bars and all the fabulous restaurants in between, you’ll find plenty of kid-free fun in Orlando.